This test goes beyond its competitors and breaks down your ethnicity into smaller sub-regions within countries. 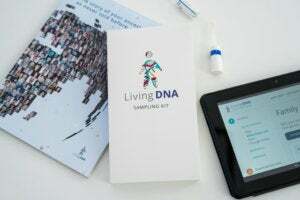 The newest player in at-home DNA testing, Living DNA claims to be the “world’s most advanced DNA test.” Not only does the company provide a report on your ethnic ancestry, but it also offers information on your maternal and paternal ancient ancestors. Living DNA calls itself a three-in-one DNA test, as it inspects there parts of your DNA: your autosomes, yDNA from your father, and mtDNA from your mother. However, be aware that only males inherit yDNA from their fathers, so women will only get results based on autosomes and mtDNA. Like other ancestry tests, Living DNA tests your autosomes (chromosomes you share with relatives on both sides of your family) to figure out your recent ethnic ancestry. This type of test can match you with relatives up to ten generations apart. 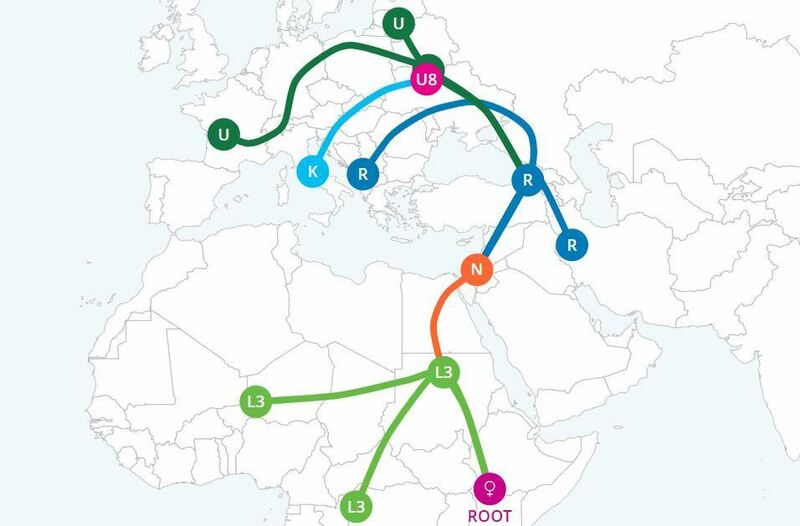 Living DNA's family matching system is still in beta, but they do already offer a way to explore your ancestry through migration history and ethnic estimates. After sending off your sample, you’ll eventually have your results digitally. Where Living DNA stands out is the amount of detail offered in its results, delivering many interesting visualizations and writing about your ancestors. It’s also the first to illustrate 21 specific sub-regions of the United Kingdom your DNA may come from. (In comparison, AncestryDNA has 13 regions.) Other countries have sub-regions, too, with more on the way. Note: This review is part of our best DNA test kit roundup. Go there for details about competing products and how we tested them. I found the 2-in-1 combination of swab and tube sturdy and well-designed. The overall process beats the heck out of saliva-based tests, which requires having to spit over and over again in a cup. 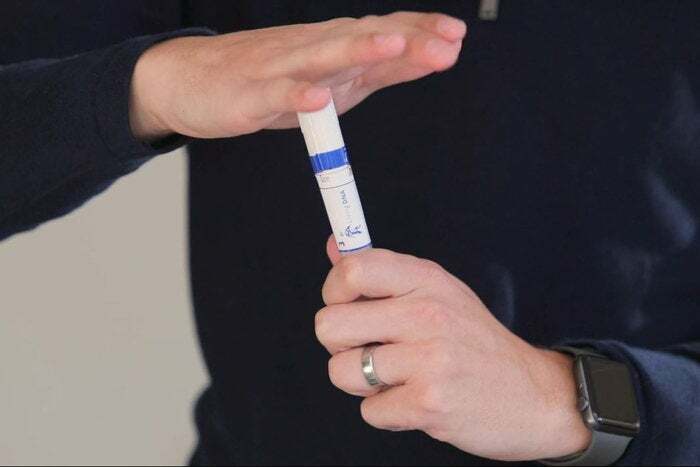 It also only requires one mouth swab instead of two or more like the kits offered by competitors MyHeritage and GPS Origins. Living DNA’s 2-in-1 mouth swab and DNA sample container was so cool. 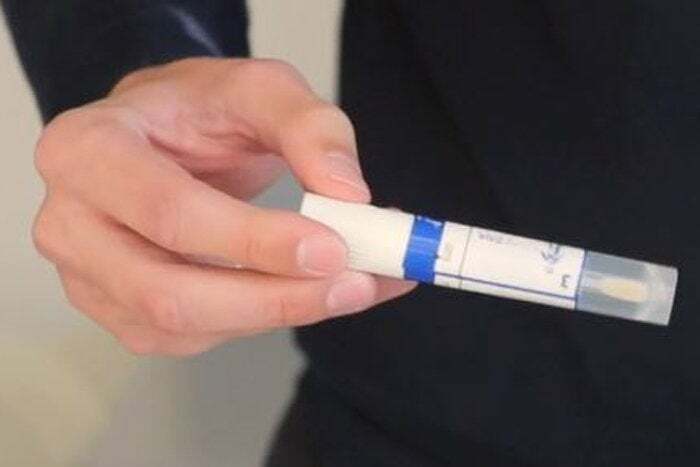 Before you can swab your mouth, make sure you don’t eat, smoke, or drink caffeine for at least one hour because this can affect the quality of the DNA sample. 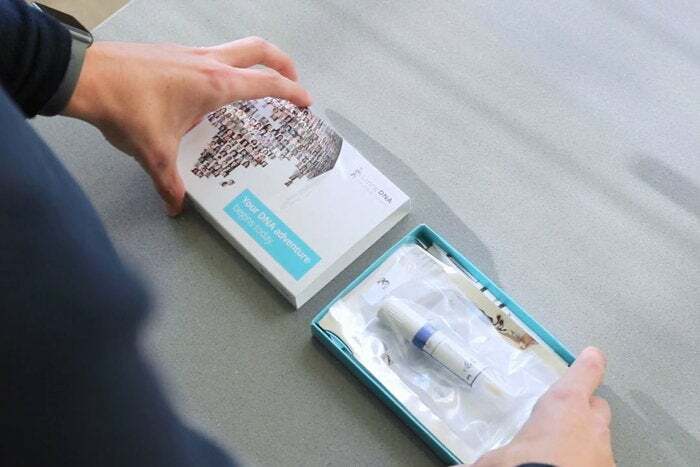 Like other services, Living DNA also recommends you have a clean mouth so you might want to rinse and have water 30 minutes before taking the sample. The whole process was very simple thanks to the 2-in-1 tube for collecting your DNA. Your DNA is found on the insides of your cheek so you should use a firm anti-clockwise motion on both sides to collect it, making sure not to draw blood. After you swab your cheeks, you seal the swab in the tube tightly and push it inward to release the drying mechanism to preserve the sample. Then you place a place a barcode on the tube, put in in the specimen bag, and send it off in the return mailer. Make sure to press hard to release the DNA preserving fluid. Be sure to activate your kit online so you can receive your results digitally. The code is found on the specimen bag, so jot it down or activate your account before sending off your sample. Living DNA takes 6 to 8 weeks to deliver your results after your sample arrives at its lab. 23andMe, which provides similar reports, also takes between 6 to 8 weeks. AncestryDNA also takes 6 to 8 weeks and MyHeritage is the shortest at 4 to 6 weeks, but these tests examine less of your DNA. Living DNA shines when it comes to the detail it offers in its results. You can explore your DNA story with a range of panels that bring up colorful interactive visualizations and history on the ancient cultures you share your heritage with. The Ancestry panel has three sections: Family Ancestry, Motherline, and Fatherline. The Family Ancestry panel’s layout and information are very similar to what you get from most other DNA tests. It’s divided further into four sections: Map, What Makes You, Chart, and Through History. These panels give you a breakdown of your ethnic ancestry through interactive visualizations. Living DNA’s What Makes You visualization. 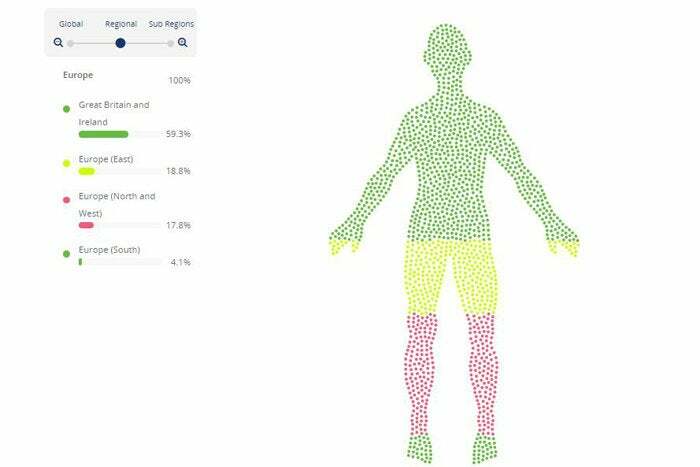 What Makes You and the Chart panel are two graphics dividing up your ethnic estimate into a visualization of a body. Using a slider, you can look at your global, regional, and sub-regional heritage. Global refers to large regions like Europe and Africa and regional is organized by country or groups of countries. Map shows the same information in a different way, allowing you to click on ethnicities to zoom into specific areas. Like the previous two visualizations, you can also move between your global, regional, and sub-regional ethnic groups. Living DNA’s most unique feature is how it can provide specific information within a country for sub-regional groups. Right now, Living DNA provides the most detail for the UK, which can estimate your ethnic percentage for regions such as Cornwall and East Anglia. The company says it’ll add more sub-regional breakdowns for other countries, like Germany and Italy, as time goes on. You can adjust the map’s regions and how cautious the estimate is. You can also change the outlook between Complete, Standard, and Cautious. Complete and Standard are essentially well-educated guesses about your ancestry, while Cautious claims to be the most accurate of the three based upon available genetic science. 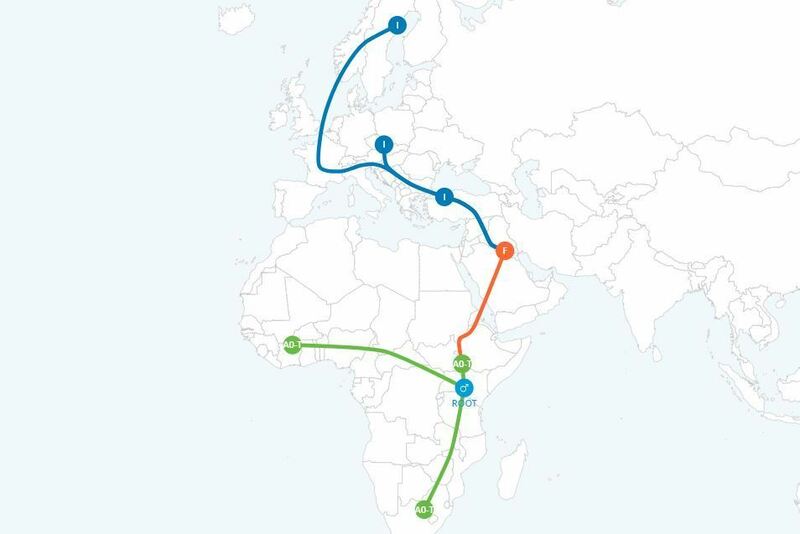 The final section, Through History, charts your ancestors’ migration patterns across the ages. 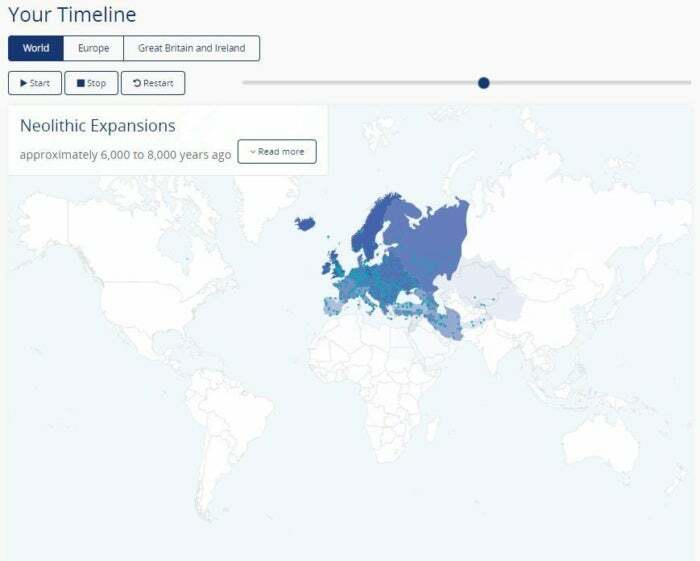 You can hit play to watch your ancestry spread out across a world map starting from 1,000 years and going as far back as 80,000 years. It was very cool to see tens of thousands of years play out in a minute, and it comes accompanied by a section that updates with historical information as the years progress. Living DNA’s Through History visualization was fun to watch. My personal ethnic estimate differed considerably from AncestryDNA and 23andMe’s results, which named 40 percent or more of my ethnicity as German and Scandinavian. 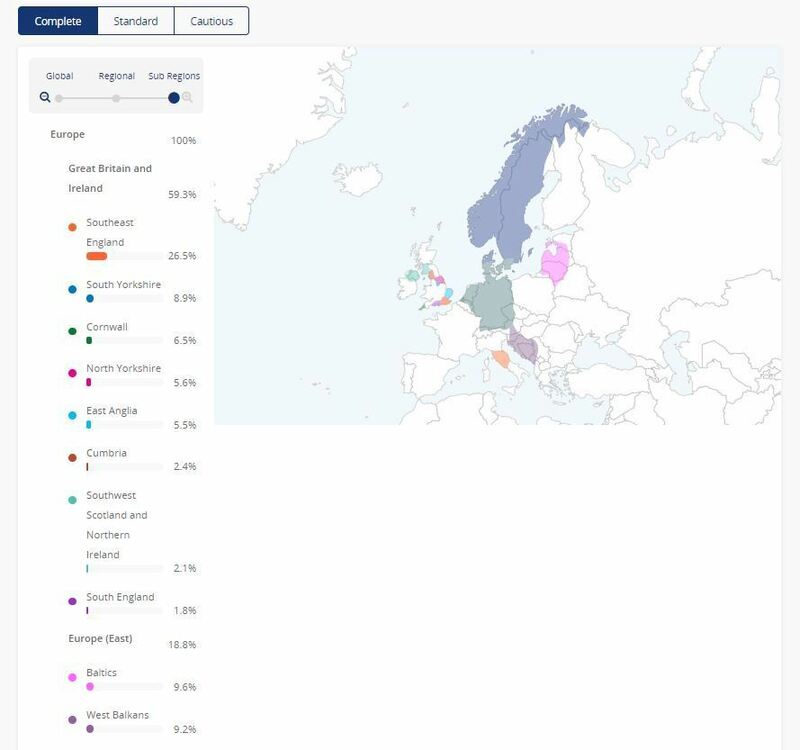 In contrast, Living DNA pegged my Scandinavian ethnicity at 7.1 percent and Germanic ancestry at 10.7 percent—a surprising assessment, since most of my family has been in Germany for generations and my father immigrated from there. I also believe it inaccurately estimated my British heritage at nearly 60 percent. But Living DNA offers a lot more than this ethnic breakdown in its Motherline and Fatherline sections. 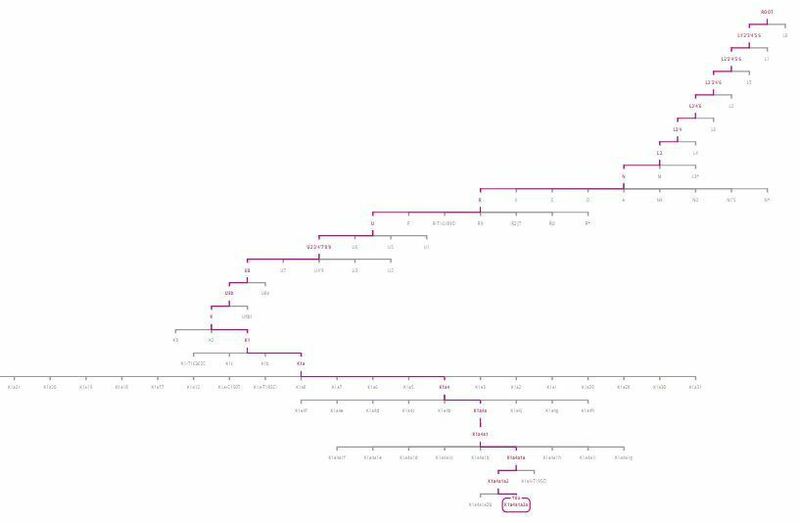 Both of these reports are divided into four panels: History, Coverage Map, Migration Map, and Phylogenetic Tree. History is exactly what it sounds like, providing a large writeup about the origins of your ancient ancestors on either your mother’s or father’s side. Apparently, I descend from “the first agriculturalists of the Neolithic Era” on my mother’s side. More interesting are the Coverage Map and Migration Map. The Coverage Map shows the areas where your mother’s or father’s haplogroup originated from. (You might remember this from the intro, but to remind you: A haplogroup is a set of people who share DNA with an ancient common ancestor from tens of thousands of years ago.) 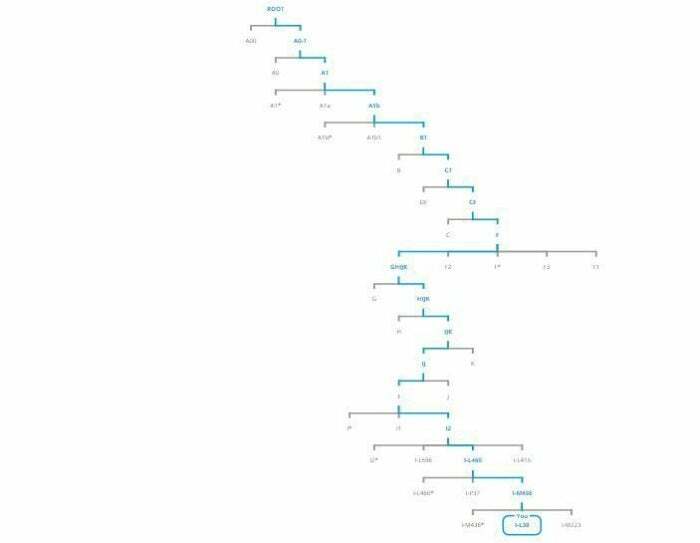 Both Living DNA and 23andMe placed me in subgroups of the same haplogroups on my mother’s and father’s side, leading me to think both of these tests were fairly accurate. The origins of my mother’s haplogroup. The origins of my father’s haplogroup. Another interesting feature of the Motherline and Fatherline panels shows your ancestor’s migration history dating up to 80,000 years ago. It begins in the point of time where it’s theorized we all share the same yDNA or mtDNA. Over time, this DNA acquired more variations as your ancestors moved across the world and had children. Living DNA uses its genetic research to pinpoint and estimate the pathways your forebears took to the regions that your more recent ancestors hail from. The final visualization is the Phylogenetic Tree or your “evolutionary tree.” This shows the path leading to your position in the evolutionary tree of life, with each node on the tree representing a common ancestor. The last level, representing you, lists the subtype of your haplogroup expressed as an alphanumeric signature. For those who want a physical copy of these results, Living DNA offers an optional coffee table booklet for an extra $69. We didn’t order it, and we’d hesitate to recommend it at that price—these booklets don’t come with hard covers. One feature missing from Living DNA is a system that matches you with genetic relatives. Rivals like AncestryDNA, MyHeritage, FamilyTree, and 23andMe all offer this option. Living DNA did tell us it will soon add a fully-featured relative matching called Family Networks, but at this time it's only available in beta. As of writing, no matches have appeared in my panel. Like other services, Living DNA will also allow you to upload raw DNA data from other tests to improve the detail of your results. Living DNA told PCWorld that uploading DNA right now will only update your with genetic matches with relatives, but eventually, they’ll also use this data to improve your ethnic breakdown. By default, Living DNA doesn’t share your DNA data with third parties without your express consent. The company also encrypts data using the AES-256 standard, which should make the data very difficult to crack. ”DNA data is stored separately to any personally identifiable information, and linked with an anonymous key,” a Living DNA spokesperson said. If you do choose to opt to share your data, Living DNA says it will be provided to “leading academic research partners on projects that will benefit society,” and that the company doesn’t work with private research groups like pharmaceutical companies. You can grant and revoke your consent at any time. When you first sign up, you can opt-in at that time; to revoke it, go to the research panel and tick the box that says you don’t want to participate. Living DNA costs $99, which is the same price as AncestryDNA and 23andMe, but $40 more than MyHeritage. Notably, Living DNA's matchmaking system is still in its early beta testing days, while its competitors have more robust services. So with the price being more or less the same than other competitors, what makes it worth it? Despite not having a completed matching service yet, Living DNA provides a surprising amount of detail about your origins that AncestryDNA and MyHeritage doesn’t. What’s more, it offers extra details in the form of sub-regional breakdowns for the UK and says other regions outside the UK are on the way. But overall, the test is in many ways a competitor to 23andMe, which has all the same features except the sub-regional breakdowns. However, because Living DNA is newer, it doesn’t feel as refined as 23andMe despite costing the same. Still, it's a very well-put-together test and service, especially if you’re looking to discover the sub-regions of countries where your more recent ancestors lived. Living DNA uses some of the most recent genetic research available to present a detailed overview of your ancestry you won’t find anywhere else. It can even breakdown your ethnicity into smaller sub-regions within countries. But as of now, it’s still missing a key feature offered by other providers: DNA matching with relatives.